There is something about wild horses running free that has always fascinated mankind, and the wild horses of Namibia have become one of the country’s top drawcards for visitors to Garub in the Namib Naukluft National Park. Mystery surrounds these creatures with regard to where they came from and how they have managed to survive for over a century in these unhospitable conditions. 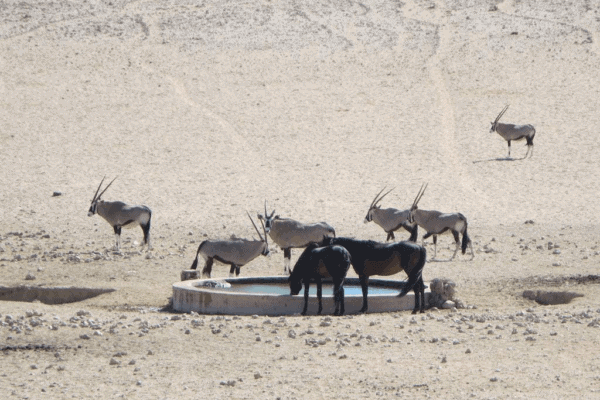 Thanks to intensive study by historians and zoologists, we now have some answers to these puzzles but this in no way detracts from the magic of watching these creatures completely at ease among Namibia’s barren landscapes. These experts have come to the conclusion that the Garub horses first entered Namibia under the auspices of the South African military, while at war with Germany over ownership of Namibia during 1914. At this time, a large South African battalion with 1 700 cavalry horses was stationed at a strategic spot around a well in the vast no-man’s land surrounding Kolmanskop. On the morning of March 27 German military reports indicate that a single German aircraft managed to make its way to this camp and drop several bombs – causing total disarray. Before the SA troops could react, a number of their horses had broken free and hightailed it well into the depths of the uninhabited desert – never to return. Driven by hunger and thirst, these animals followed what grazing and water sources they could find before stumbling upon the Garub waterhole. The only permanent water source around these parts, this water source was originally set up as a watering point for steam trains. As time went by the horses joined up with other escapees from stud farms in the area, and today about 200 of these animals roam the area in several loosely defined herds. Although the horses have not undergone any biological changes to enable them to survive these trying conditions, they have adapted their behaviour to suit the environment by learning to withstand levels of dehydration that would cause domestic horses life-threatening stress, and are able to somehow keep going on what grazing there is. The going often gets tough for these creatures with food, water and inbreeding being major challenges for them. Times of drought, like now, are particularly devastating, with major losses occurring due to lack of grazing and predation on the young and weak by opportunistic predators such as hyena. From time to time, horses are also killed by speeding motorists driving along the road past their feeding grounds. In response to these hardships, the Namibia Wild Horses Foundation was established in 2012 to conduct research into the horses and keep track of their movements and well-being. Despite the horses’ coping mechanisms there are times when the foundation has had to step in and provide supplementary feeding to prevent their total eradication. If it were not for their actions and the continued support of businesses and private individuals, Namibia would not have any wild horses left. The wild horses of Namibia are an important drawcard for tourists to the area and their existence has no ill effects on the environment which makes them worth preserving. They are often seen in the company of the indigenous Gemsbok and ostriches, and exist peacefully with these other species. You can view these animals drinking from the well at Garub from a hide alongside the road, 20km from Aus. If you would like to assist with donations towards their welfare, visit the Namibia Wild Horses Foundation’s website for more information. Copyright © 2019 Arebbusch Travel Lodge. All Rights Reserved.